I can be a forgetful guy. The good news is, I'm aware of that fact, and can compensate. Most of the time, that just means that I have to be extra-vigilant. Which means I'm constantly checking and re-checking to make sure the doors are locked, that there's nothing left on my schedule for the day, and so on. But I'm tired of checking the garage door. It's time to get a MyQ iOS garage door control. 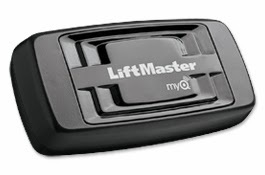 MyQ is the brand name used by LiftMaster and Chamberlain in automated garage door control. With MyQ, your garage door opener can report its status over your home network. If you leave the garage door open, you'll get a notification on your iPhone. And with a click in the app, you can close your garage door - even if you're miles from home. If I were buying a new garage door opener today, I'd make sure it had MyQ built in. 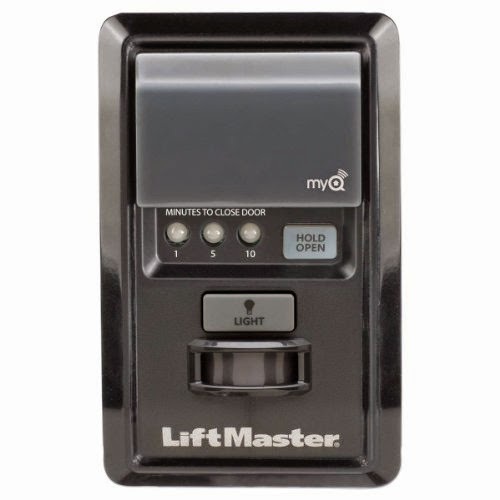 But we already have a perfectly good Raynor Aviator garage door opener. It's great - quiet belt drive, no worries. I'm not about to replace it. 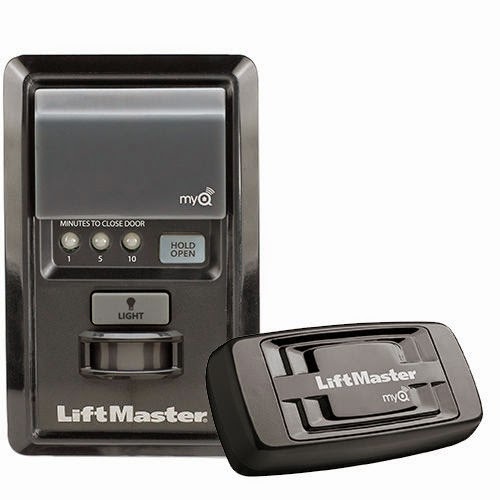 So how can I get this MyQ goodness on my 6-year-old garage opener? Especially one that isn't a LiftMaster or Chamberlain? First off, I checked here in order to determine that my garage door opener was compatible with MyQ. My Raynor Aviator has a purple program button - it qualifies. So what products do I need? First and foremost, this thing is going to have to be able to talk to our home network. The good news is, our house is crawling with Airport Express wireless extenders, so we're going to have a good wifi signal in the garage. These run about $50 at retail, and usually $40 or less on eBay. But what good is the ability to communicate with your garage door opener, if it can't respond with action? This replaces the current control panel on our garage wall. With the 888LM, the garage door can be raised and lowered, based on the controls received from our iPhones by the Internet Gateway. It also has a motion detector, and will turn on the garage door opener's lights when you enter the garage. This will be a huge selling point for Ms. AAAD. MyQ can also be used to control lights - we're definitely looking for a way to control our exterior lights without having to go out into the garage and hit the switch. With the MyQ system, we'd be able to control our exterior lights from our smartphones. But.... that isn't good enough. I don't need direct control of those lights - I want them to turn on at sunset every day, stay on for a few hours, and then turn off. As of now, a "dumb" switch like the GE Sunsetter is better for our needs. It's not connected to the internet, and can't be controlled by an iPhone, but it has an internal clock and knows the date, and time of sunset in your zip code. I'll be buying the 828LM and 888LM on eBay tomorrow, and will have a post detailing the install at some point next week. I think I can do better than the $100 retail package price these items usually go for - we'll see. UPDATE: I was able to beat the $99 retail price for these 2 items by quite a bit. Exclusively using eBay Buy It Now, I was able to get my 828LM Internet Gateway for $38.40 shipped, and my 888LM Control Panel for $25.99 shipped. Both are new in original packaging. So, all told, $65.00, all-in. 35% off retail! I'll have a full post detailing the install. Or is the solution you needed actually the 'MyQ Garage' unit? aodretail is a renowned name in the world of manufacturer of automatic rolling garage, shop doors. Their items are highly classified. They supply their goods all over the world. They also take orders on online. It is acceptable to reputed clients. As I am always busy with Bestessays writing, I come home and sometimes forget to check if the garage doors are closed. Thanks a lot for that gadget, It would be useful.